Drain tuna and place in large bowl. Finely slice spring onion and add to tuna. In food processor finely process Ryvita, ground pepper and walnuts together. Add lemon juice and egg whites and stir in well. Add Cottage cheese and mix until well combined and tuna well broken up. Divide into 7 patties (using a 1/3 cup measure packed with mixture) and form into balls with hands. Gently pat down and refrigerate until ready to cook. Dry fry or add olive oil for better flavour (add calories) for 3 minutes each side or until well browned. The patties are quite soft inside. When you fry them you want a nice crisp top. We prefer to use the olive oil as it is a good oil in out diet but you will have to add the calories and perhaps only have one patty instead of two. This may be difficult as these are delicious and a favourite meal in our home. I think the cheese gives it a naughty cheese flavour. 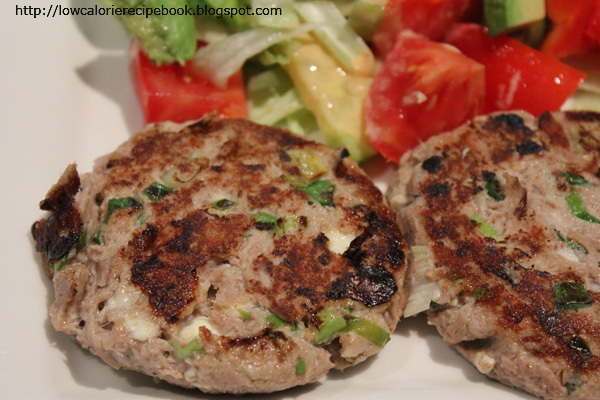 Freeze extra patties for easy to make meals. Add side salad calories. Avocado is nice with this meal but be conservative as it is healthy but fattening.